In an extraordinary post on Medium, Jeff Bezos has revealed threatening emails he received from attorneys for The National Enquirer, after Bezos refused to call off an investigation into how the paper got access to his private text messages. 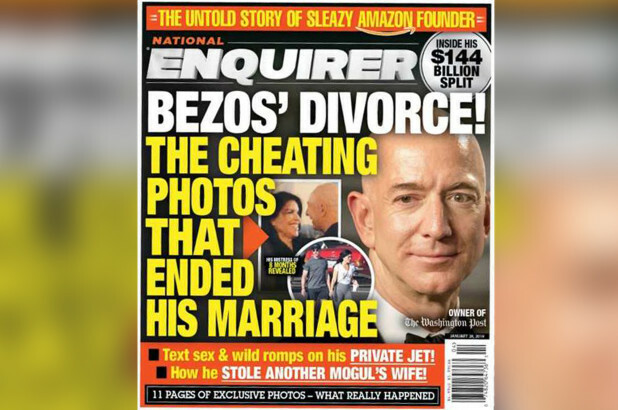 "In the AMI [owner of the National Enquirer] letters I’m making public," writes Bezos, "you will see the precise details of their extortionate proposal: They will publish the personal photos unless [my lead investigator] Gavin de Becker and I make the specific false public statement to the press that we 'have no knowledge or basis for suggesting that AMI’s coverage was politically motivated or influenced by political forces.'" "These communications cement AMI’s long-earned reputation for weaponizing journalistic privileges, hiding behind important protections, and ignoring the tenets and purpose of true journalism," writes Bezos. "Of course I don’t want personal photos published, but I also won’t participate in their well-known practice of blackmail, political favors, political attacks, and corruption. I prefer to stand up, roll this log over, and see what crawls out."